Our website should be faster now. In the past few months I began to notice that pages were loading slower than I would have liked. But I think I've tracked down the issue and pages should be loading quicker again. Check out the site and click around. - Ever Thought of Becoming a Dog Trainer? Do you know how to keep your pet healthy, Heal Your Pet Naturally at Home, and Help your Dog or Cat Live Longer? The reason I ask is because I'm inviting you to a VIP teleseminar training call this Thursday. Dr Jones will be revealing some of his Veterinary Secrets and releasing his Complete Home Study Multimedia Course Version 2.1 Plus you'll FIND out How to Heal your Pet at Home with his TOP Natural Remedies. To register using our affiliate link. The TRUTH behind Vaccines- HOW to avoid these disastrous side effects, and the *exact* Vaccine regimen Dr Jones advises for your dog or cat. The TOP ways to prevent disease. This is must know material if your pet is to stay healthy and live a long and fulfilled life. The best diets for your pet - Dr Jones can show you what to feed, how to choose a quality pet food, WHICH supplements to give, and The SAFE treats to use. There are only 500 lines available, so register early to CLAIM your spot. The seminar will take 90 minutes out of your day (Thurs, Nov 19th), but what you'll learn may make a BIG difference in the Health of your dog or cat. P.P.S. Dr Jones put up a NEW Video on his Blog - it's a Small Section from his Workshop in which Pet Owner's like you were shown HOW to use his Natural Healing Techniques. P.P.P.S. His NEW F*r*e*e Report called Dr Jones' TOP 10 Veterinary Secrets for Keeping Your Pet Healthy, Healing Your Pet At Home, and Helping Your Dog or Cat Live Longer is here. Ever Thought of Becoming a Dog Trainer? These days a lot of us are feeling the pinch and looking for new careers or ways to earn extra income. One great way might be right under your nose. You love dogs and you have experience training your own Aussie (right?). Why not take it to the next level? But lately, you’ve noticed that he’s become destructive around the house whenever he’s left alone, even for just a few hours. You come home and the house looks like it was hit by a tornado – papers scattered everywhere, the trash can was knocked down, and your clothes were chewed into shreds. There are many causes for separation anxiety in dogs. Some were developed with experiences they had before the dog ever became part of your family, such as loss or abandonment of previous owner. 1. A traumatic experience such as an injury, thunderstorm, or an alarm system going off that happened while you were gone. 2. A loss or addition of a family member. 3. Premature separation from its mother and littermates. 4. Having a new pet in the house and spending a lot of time with that new pet and less time with him. 5. A sudden change in schedule, lifestyle, or environment. 6. Changes that occur in older dogs, both physiologically and mentally, that results from aging. I'll keep you posted on how the e-book is coming. It is a lot of work but I want it to cover a lot of information and be a valuable resource for Aussie owners. FetchDog is offering Fr'ee Shipping Right Now (until 12/23/2009) on their products. So if you've been thinking of ordering from them now is a good time. You can still get an 18% Discount on Wysong Dog Food too! Just enter our exclusive coupon code AUSSIE18 when you checkout. Thanks to everyone who has submitted your Aussie stories and photos! This time we have a great story from Dwayne Carrick and Bo his loyal (and hard working) Aussie. Since Dwayne and Bo met they have been best of friends and co-workers ever since. 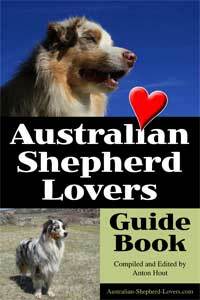 Do you have a great story to tell about your Aussie? Can you help answer questions that other Aussie owners have? Hummer is our gorgeous boy. He is a huge snuggle puppy who loves to play with his sister Fozzie (5 year old blue merle) and brother Mojo (6 month old Blue merle) . He is hilarious and has a sweet, wonderful personality. We love our Aussies! Thanks to Austin & Lesleh Sprecker of Wentzville, MO for sending in this great pic of Hummer, their 3 year old male Aussie.